Muir Woods consists of a 7-acre forested tract northwest of Bascom Hall and east of the Sewell Social Sciences Building. Even though it is located near the busiest part of campus, with literally thousands of people passing by each day as they travel up Bascom Hill and Observatory Drive, it remains a relatively secluded part of the Preserve. In many ways, it is one of those little secrets that hides in full view. The formal name for this area is John Muir Park, a tribute to the great naturalist who once lived at North Hall just across the road. The wooded north-facing slope on Bascom Hill has been known by several names since the establishment of the university in 1848. The earliest reference is simply University Woods. 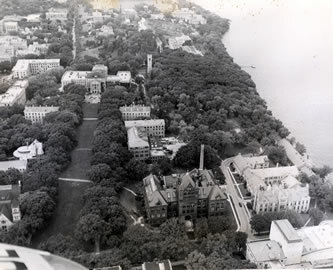 We surmise that the name Bascom Woods started to be used sometime in the 1920s, following the renaming of nearby University Hall to the current Bascom Hall in June,1920. The name Muir Woods probably came into use beginning in the early 1960s, following the formal designation of this wooded area as John Muir Park. That this area should be named for John Muir, the famed naturalist and conservation leader, is fitting for several reasons. During the early 1860s, Muir was a student at the university, living and studying in North Hall. The window in his dormitory room looked directly out towards the place that would one day bear his name. There is little doubt that Muir visited this wooded area during his frequent botanical collection forays in the vicinity of Lake Mendota. It is even quite likely that he ventured into these woods to gather fuel for North Hall’s stoves. Four years after his death in 1914, the university first acknowledged his important contributions to the nation’s nascent conservation movement by designating the knob of land across from North Hall as Muir Knoll. 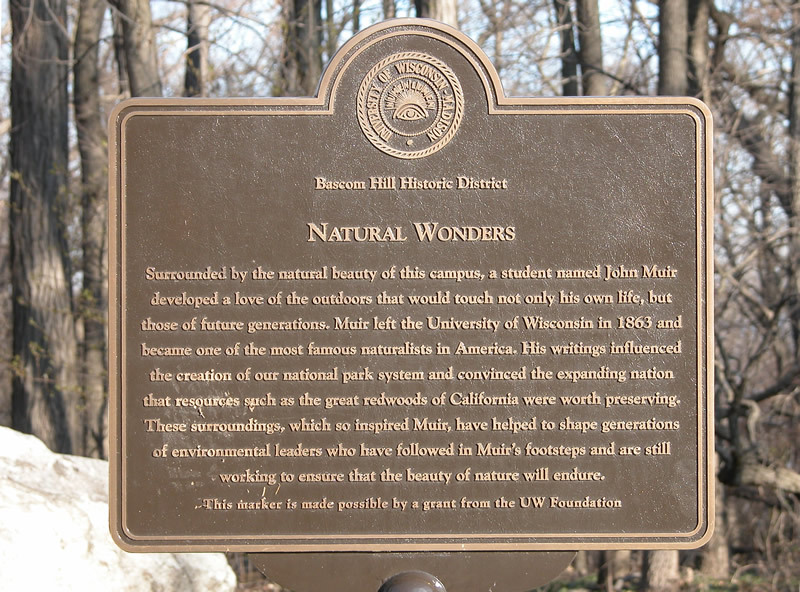 The second time the university honored Muir came as a consequence of a controversial proposal to construct a new building to the west of this same natural area. In the late 1950s, the university developed a plan to construct a “Sociology-Anthropology-Economics Building” in an area of Bascom Woods north of the Carillon Tower. For several years, angry faculty fought the Board of Regents and the Campus Planning Commission in defense of these woods. The land conservation values they invoked during this controversy had much in common with the ones Muir expressed in his land conservation battles out west. The faculty Advisory Committee on Campus Wooded Areas, headed by the renowned botanist John T. Curtis, and including members D. M. Angevine, Grant Cottam, Arthur D. Hasler, and G.W. Longenecker, developed a proposal that they hoped might thwart the entire project. In early 1959, the committee approved a resolution recommending the establishment of a John Muir Park—to include most of what was then Bascom Woods. 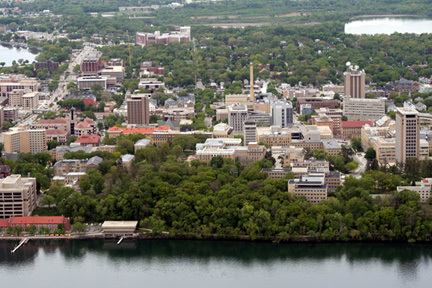 The committee also recommended that the new park be augmented by additional wooded “outdoor biological laboratories,” including: the area north of Lathrop Hall, land south and west of Birge Hall, the area between Sterling and Bascom Halls, and the land east of the Observatory Office building. Despite the broad opposition to the building, construction was finally approved. The new Social Science Building was completed in two phases: an initial structure in 1962, followed by an addition to the north side in 1966. The proposal to establish a John Muir Park was eventually implemented, but the boundaries of the park were drawn in such a way that the new academic building—by then a fait accompli—necessarily intruded upon the western portion of the wooded area. A formal dedication ceremony for the new John Muir Park was held on February 8, 1964. Interestingly, the park dedication ceremony was attended by the U.S. Postmaster General, who as part of the celebration unveiled the design of a new John Muir commemorative stamp. Indeed, it can said that the establishment of the Lakeshore Nature Preserve can trace its origins to the hopes and values expressed nearly 50 years ago by faculty and citizens who cherished this place and fought for its preservation. Staircase in Muir Woods. Photo by William Cronon. Rebecca Kagle, a graduate student at the Nelson Institute for Environmental Studies, planned and implemented ecological restoration projects in Muir Woods between 2005 to 2007. Her research and field work were conducted under the direction of faculty advisor Professor Evelyn Howell, from the Department of Landscape Architecture. Prior to European settlement, this woodland was most likely either savanna or mixed oak woodland. It has since moved towards a more mesic sugar maple and basswood forest. The site exists on a slope and the plant communities differ somewhat from the top to the bottom of the hill. Analysis into the different zones within the woods is currently being conducted based on a vegetation inventory that took place in the summer of 2006. The top of the hill consists of large red oak (Quercus rubra), and white oak (Quercus alba) and a large stand of black locusts (Robinia pseudoacacia). There have been plantings of sugar maples in the middle section of the slope that are intermixed with large basswood (Tilia americana), red oaks, and white oaks, and shagbark hickories (Carya ovata) and hackberries (Celtis occidentalis). Notable trees in the woods include: patches of hophornbeam (Ostrya Virginia) north of the Social Science building, and a few tulip trees (Liriodendron tulipifera) adjacent to the Social Science Building. The forest mid-layer is similar throughout the slope. The trees that have reached sapling size are a mix of box elder (Acer negundo), white mulberry (Morus alba), American elm (Ulmus americana), hackberry (Celtis occidentalis), and green ash (Fraxinus pennsylvanica) with an occasional black ash (Fraxinus nigra) and basswood present. At this point, there is essentially no natural regeneration of oak trees. The shrub layer is composed of dense stands of chokecherry (Prunus virginiana). Found with less frequency are highbush cranberry (Viburnum opulus) and both red and blue elderberry (Sambucus racemosa and S. canadensis). The highbush cranberry is an exotic species while the chokecherry is a native that is highly aggressive and can alter the ability of woody and herbaceous plants to establish and reproduce. One of the most notable aspects of Muir Woods is its display of spring ephemerals and spring wildflowers. In early spring, there are wildflowers carpeting the woods that are often only present until the tree species leaf-out. Species that can be found include troutlilly, cutleaf toothwort, trilliums, and bloodroot. In many other areas of Wisconsin, these species are declining due to deer browse and other factors. These flower populations are being monitored by students in Landscape Architecture 651: Plant Community Restoration and Management Workshop. Other wildflowers that can be found in these woods are wild columbine, wild geranium, zigzag goldenrod, white baneberry, and Jack-in-the-pulpit. There has been a fairly large-scale invasion by non-native plants, including buckthorn (Rhamnus spp. ), honeysuckle (Lonicera spp. ), white mulberry, highbush cranberry, creeping euonymus, and garlic mustard (Alliaria petiolata). Notably, only one patch of first year garlic mustard appears to be present on the site which is promising and is most likely due to the efforts of volunteers, who have been pulling garlic mustard in the woods for over 15 years. The other invasive species are being removed as part of the current management project. The close proximity of Muir Woods to the central core of campus makes this part of the Preserve an enjoyable place for a short walk or a respite from the hectic pace on adjacent Observatory Drive and Bascom Hill. Most people probably experience Muir Woods mainly along the short trail from Muir Knoll down to the Lakeshore Path. Next time you are visiting the woods you might try venturing down one of several other trails that will take you to less visited areas toward the west. One of the virtues of having a wooded parcel so close to major classroom buildings such as Science Hall, Social Science, Birge Hall, and Education is that students and their instructors can easily visit Muir Woods-even during relatively brief class or discussion sections. Students from geography, environmental studies, and humanities classes can often be found here either studying or finding inspiration in a natural setting. 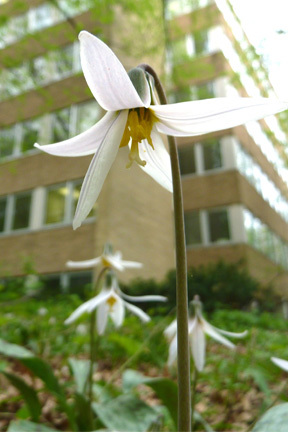 Trout lily next to Social Sciences building. Photo by Bryn Scriver. The 2006 Lakeshore Nature Preserve Master Plan envisions a variety of cultural and ecological projects that will enhance educational opportunities, improve visitor experiences, and protect resources. Several restoration projects have already been implemented in Muir Woods, guided by the master plan and implemented by Nelson Institute graduate student Rebecca Kagle. One of Kagle’s first projects was to install an environmental monitoring grid in the woods to provide spatial referencing for a plant inventory. Once the reference points were in place, Kagle and students working under her supervision were able to identify, measure, tag, and precisely locate all of the major trees in their grid. They also identified all of the woody shrubs and herbaceous plants. In the future, this information will be used as a baseline reference to gauge how different ecological restoration activities affect the plant community over an extended period. Kagle mapped the maze of trails that criss-cross about this much-traversed parcel. After determining the routes least likely to promote erosion or damage the fragile soils and vegetation, she presented a proposal for trail improvement to the Preserve Committee. With the committee’s support, Kagle and her volunteers worked to reroute, retire, or stabilize the walking trails throughout the woods. In the summer of 2005 a walking bridge was built by a crew of volunteers coordinated by a Troop 90 Boy Scout working on his Eagle service project. 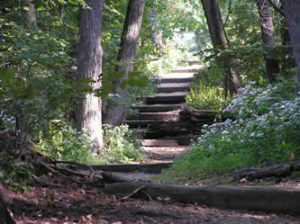 The bridge crosses a highly eroded gully near the top of the stairs leading from the Lakeshore Path. Volunteers have spent countless hours removing garlic mustard, honeysuckle, and buckthorn and replacing them with native plants such as wild geranium, elm leaf goldenrod, Penn sedge, and button bush. Funds to support Kagle’s research and implementation efforts were supplied by generous gifts from the Class of 1963, the Preserve Academic Endowment and private gifts. This financial support is vital to achieving the vision set forth in the Preserve master plan, and would not be possible without the extraordinary generosity of the Preserve’s many donors and volunteers. Muir Woods is among the easiest places in the Preserve to reach for even a brief respite from the busy central campus. 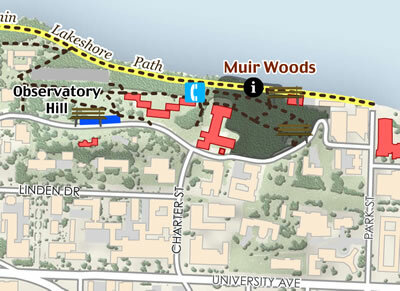 Campus bus #80 makes regular stops on Observatory Drive at the entrance to the woods. Muir Woods is adjacent to Observatory Drive. Bicycle parking racks are available at nearby Bascom Hall. You can reach the woods from the Lakeshore Path by ascending the stairs located on the slope just to the west of the Hasler Limnology Lab. Alternatively the woods can be reached from the trailhead on Muir Knoll. Metered visitor parking stalls are available in the underground lot beneath Helen C. White Library (Lot 6) off Park Street. Please do not park in lots designated for permit parking.